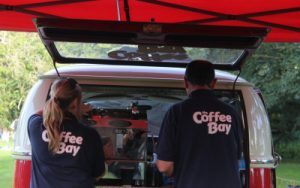 The Coffee Bay serve speciality coffee drinks using direct trade Arabcia coffee beans, freshly roasted by Heartland in Conwy. We use award winning milk produced by Llaethdy Llyn, an independent milk producer.All of our hot drinks can be made with regular milk, soya, oat or coconut milk.We also serve Hot Chocolate and have a selection of Twinings and Pukka Teas. The Coffee Bay is proud to be Green! All of our take away cups are made from a sustainable source and are lined with plant based PLA not plastic. Our take way cups and lids are 100% compostable.